next April 2, 2015 5:22 p.m. Self-defense, art display, intricate nose picking. Your perfectly manicured hand rests delicately on a small table in front of you. Your nails, which resemble Kim Kardashian’s in length and gouging ability, are matte, red, and raised slightly higher than your cuticle. The fingernail on your middle finger starts to bubble. It ripples and breaks and out pops a perfectly formed red paper crane with a white spot on its wing. The crane flaps once, twice, and then flutters from your fingernail into the air. 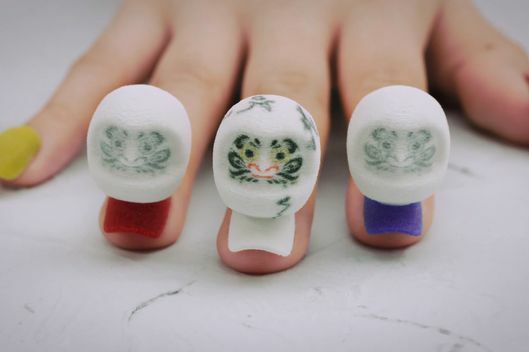 Although the future of manicures probably won’t involve animation, it might very well see a tiny, three-dimensional paper crane embellishment grace the top of an acrylic nail. At least, that’s what manicurist Hatsuki Furutani and director Mizuki Kawano envisioned when they created “Transforming,” a two-minute stop-motion film that depicts artificial nails adorned by 3-D dots, moving flowers, and swimming fish with scales only millimeters long. To make the video, the team uploaded the animation data into the ProJet 660 Pro full-color 3-D printer. They created 521 nails in total, the thinnest parts of which measure 0.56 millimeters, according to the video’s caption. The question here is not why, but why not? Aside from aesthetics, we can think of plenty of uses for these nails: self-defense, art display, extremely intricate nose-picking tool. And with the rise of 3-D printing in the dental, footwear, and aerospace industries, it seems only natural that the cosmetics industry should follow suit.